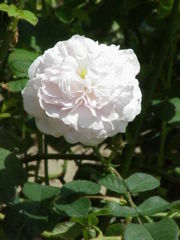 If you haven’t planted roses before, here’s a good primer how to article about planting roses. To plant roses you must first of all dig the holes, and place a little potting soil at the bottom of each hole, leaving some just to cover the roots with when set out. Have some strong sticks and tarred twine close by in case a few straggling shoots need support. Now unpack, which is always done at the last minute, if the air gets to them when out of the ground it dries up all the sap and materially weakens the plants. With a sharp knife cut off all the dead tops of the shoots, and also any roots which look mangled, taking great care not to pull off the fibrous portions (tiny rootlets attached to the main roots), as these will take hold of the new ground, and keep life in the rose trees. Hold the plant upright and steady using a trowel to put the soil in. Do not cramp the rose roots. Some of the trees have probably been growing in pots, and must have their roots gently disentangled and spread out in the hole. 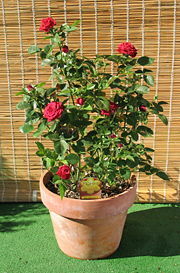 The potting soil helps to start the trees, and they soon penetrate into the heavier soil which is to produce such grand rose flowers. Only just cover the roots with the light soil, and then take the spade and fill in with the mixture of loam and well decayed manure. This must not come higher than two inches above the junction of graft and stock, which can easily be found by the different appearance of the two woods, and also from the mark faintly seen showing how deeply it has already been planted in its original home, the nursery. When filled up stamp firmly down. If this is not done, the rose tree cannot possibly make roots, if it is rocked about by the wind, and all your trouble will be a waste of time. Of course the ground must not be made like iron, but, on the other hand, the trees should be able to stand a fair tug without moving from their places. I have noticed over and over again that I had only to pull at a rose tree gently, and it would be lying full length on the ground. What can be expected of the best bush that ever grew when it has been planted in that fashion? When all the rose trees have been planted it is a good plan to mulch them, but do not begin this until that is accomplished, as it can easily wait a day or two, and it would be disastrous if darkness were to come on before the planting was done. Make a conical heap of strawy manure round each tree, as this keeps off not only frost, but a superfluity of rain. Leaf mould will serve as a substitute. Leave a space round the rose tree clear of mulch. Rotting can take place if mulch is too close to the plant. Mulch is a natural way to improve the soil.